The first day began with a symposium on thermosensory mechanisms and a false fire alarm which was an interesting start to the conference that had everyone jumping out of their seats and into the lobby! Once the false alarm had been established, a coffee break was conveniently implemented to calm the attendees…and the presenters! After the break Kirsty Waldock chaired the first session of oral presentations (a first for Kirsty!) along with Dr Peter McNaughton. During this session she presented her work on ‘The elderly’s physiological and perceptual responses to physical and perceptual cooling during simulated activities of daily living in UK summer climate conditions’, receiving some fair questions that will no doubt help ahead of her PhD submission and viva. After the oral presentations, the conference continued with poster presentations immediately outside of the conference room. Rebecca Relf presented her two posters entitled, ‘Validity of a wearable sweat rate monitor and routine sweat analysis technique’ and ‘Reliability of a wearable sweat rate monitor and routine sweat analysis techniques under heat stress in females’, receiving much attention not least from some notable researchers. Day two comprised many interesting talks around the topic of exertional heat stroke in varying populations and underlying mechanisms. 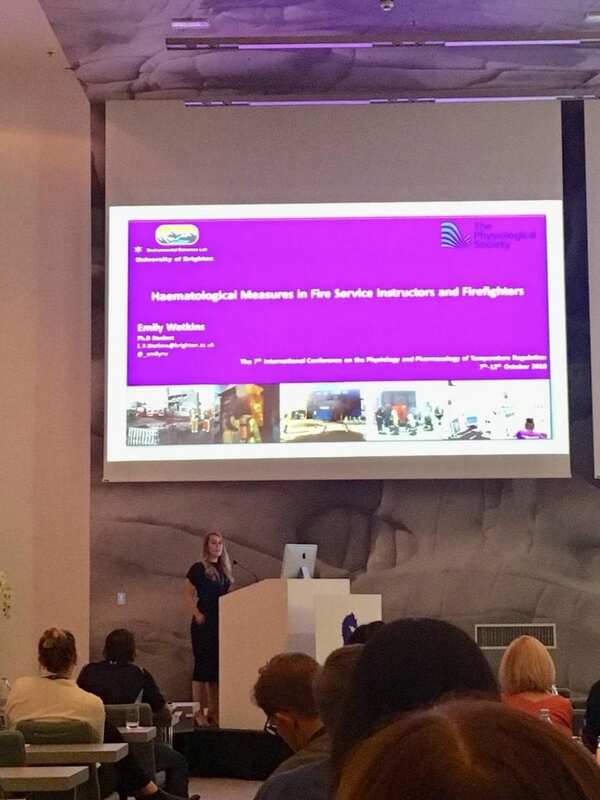 Emily Watkins presented her study on ‘Haematological and inflammatory measures in Fire Service instructors and firefighters’ which was very well received and had many attendees come forward with interesting questions. More from her work can be seen on previous blog posts here. Another highlight on day two was the symposium on climate change, occupational heat stress and sustainable solutions. The topic is more relevant than ever and it was brought forward that we all as environmental physiologists have a chance to inform the public on our research and help find solutions which hopefully change policy for the better. 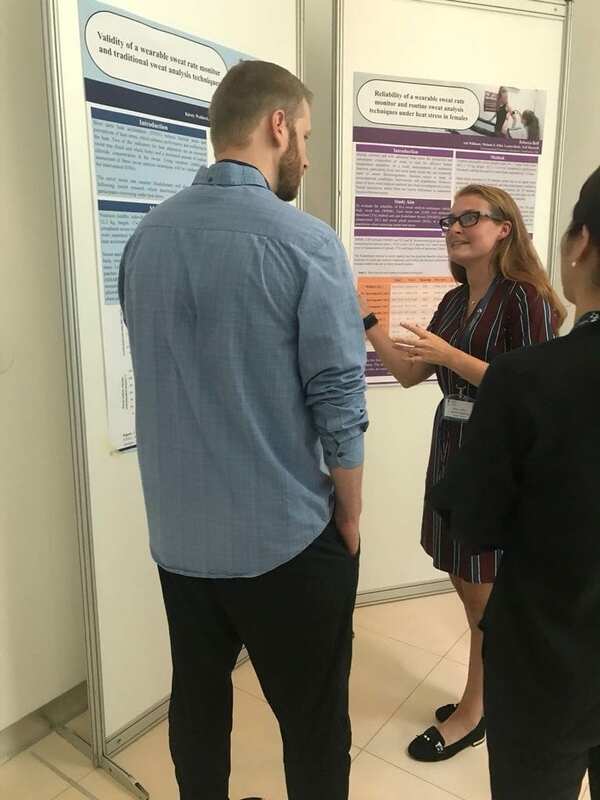 Day three exhibited many presentations on the topic of human heat acclimation and thermoregulation in clinical populations. Among some great presentations, day three brought another oral presentation from Kirsty’s final PhD study ‘Comparison of the heat adaptations between the elderly and young using isothermic short term heat acclimation’. 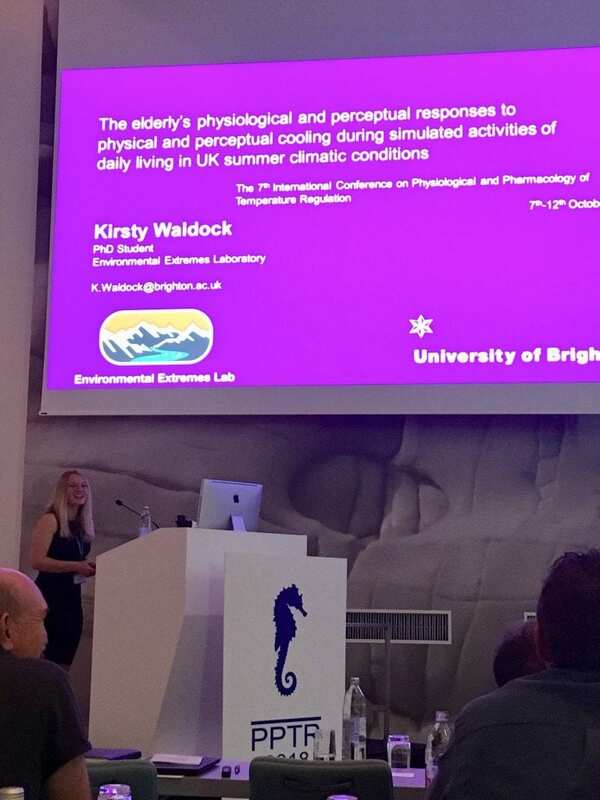 Kirsty received good recognition for what she had presented, noting how difficult heat acclimation studies are, not least with an elderly population. The day ended with a workshop for young investigators on the measurement of peripheral blood flow in thermoregulation. Techniques such as Near-infrared spectroscopy or Microdialysis were presented by experienced researchers along with the tips and tricks one rarely reads about in books or research articles. Day four was oriented around the topic of health benefits of heat and cold therapy and thermal physiology in the age of data science. Associate Professor Ollie Jay from the University of Sidney, Australia presented a wonderful approach for predicting sweat losses using a human heat balance model. The day ended with a perfect banquet and the announcing of the winners of the oral and poster presentations. The next PPTR conference will be held in Vancouver, Canada 2020. For more information follow this twitter link (homepage coming soon). Before that, the International Conference on Environmental Ergonomics will be held in Amsterdam in 2019. The Physiological Society have also organised a meeting next year themed Extreme Environmental Physiology: Life at the Limits. From the 2-4th September the University of Portsmouth will host talks on all things heat, cold and high altitude physiology which looks like it will be a great event. 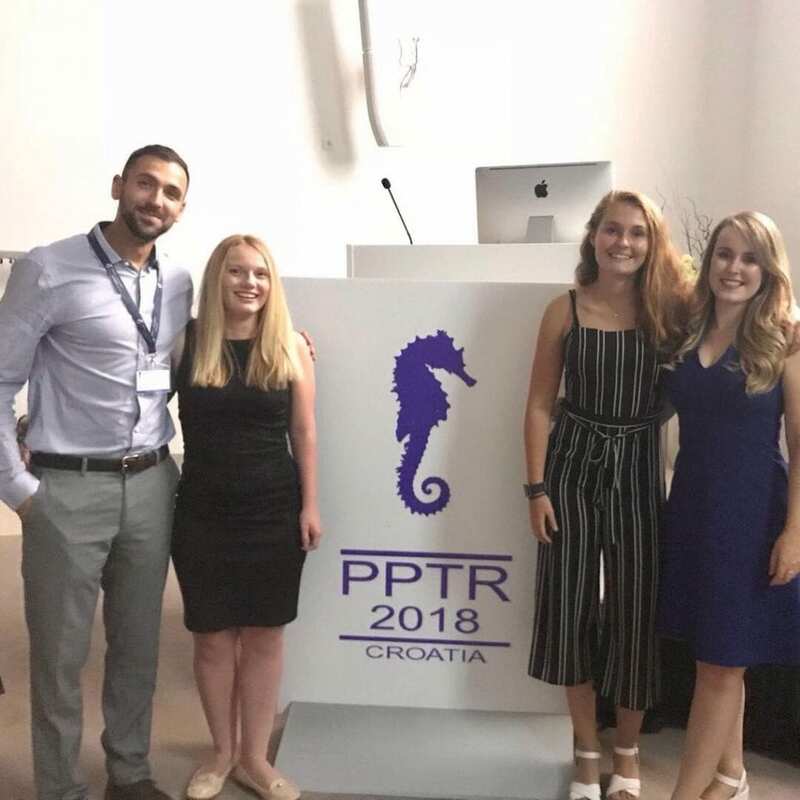 So, well done to our four research students, Gregor, Kirsty, Rebecca and Emily for representing University of Brighton’s Environmental Extremes Lab at the PPTR 2018 Conference and getting our research out there in the international scientific community. This entry was posted in Health, Heat, Occupational, PhD Student News, Research, Uncategorized by Neil Maxwell. Bookmark the permalink.